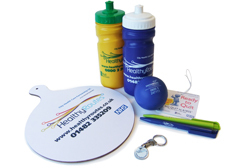 Innovative Graphics have been supplying keenly priced merchandise to CHCP for over 4 years. In support of their recent ‘Stop Smoking’ marketing campaign we supplied 28,000 branded pens, air fresheners, stress balls and sports water bottles. We presented the client with a variety of options (quality vs price) together with samples to choose from. The order was completed within 3 weeks.